These exercises are intended to provide an adaptive exercise program that will encourage participants to live a strong and healthy lifestyle. 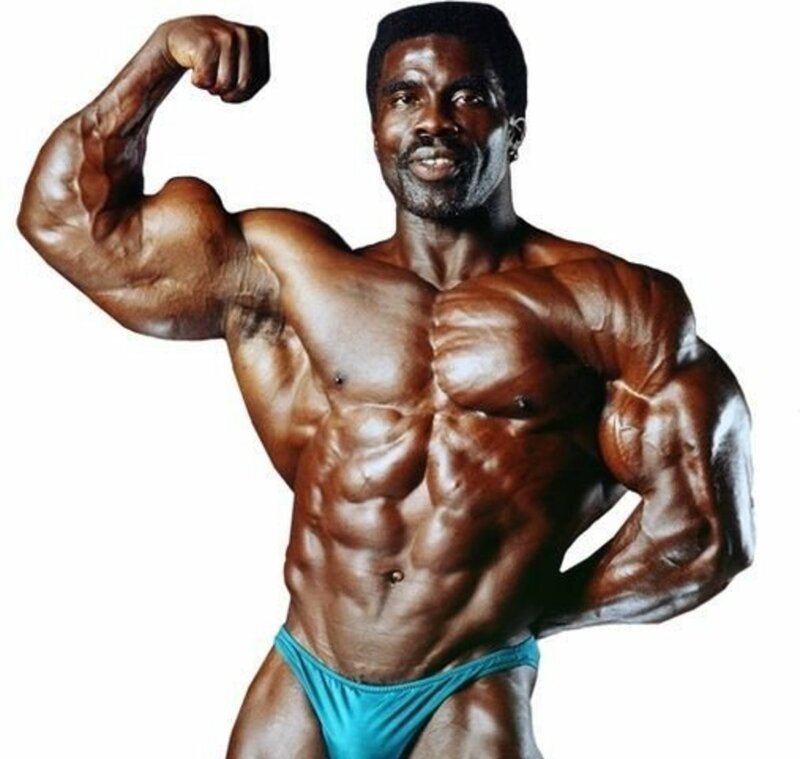 This article includes 28 strength training exercises for the upper body as well as the lower body. You will increase strength and balance by doing these exercises regularly. Try doing them every other day! Photos are of myself, taken by Kevin Stradley. Always start with a light warm up. Start with both hands to your sides. Inhale and slowly raise your hands upwards. Exhale and lower your hands back down to your sides. Repeat 10 times. Continue warming up by using your arms and legs. 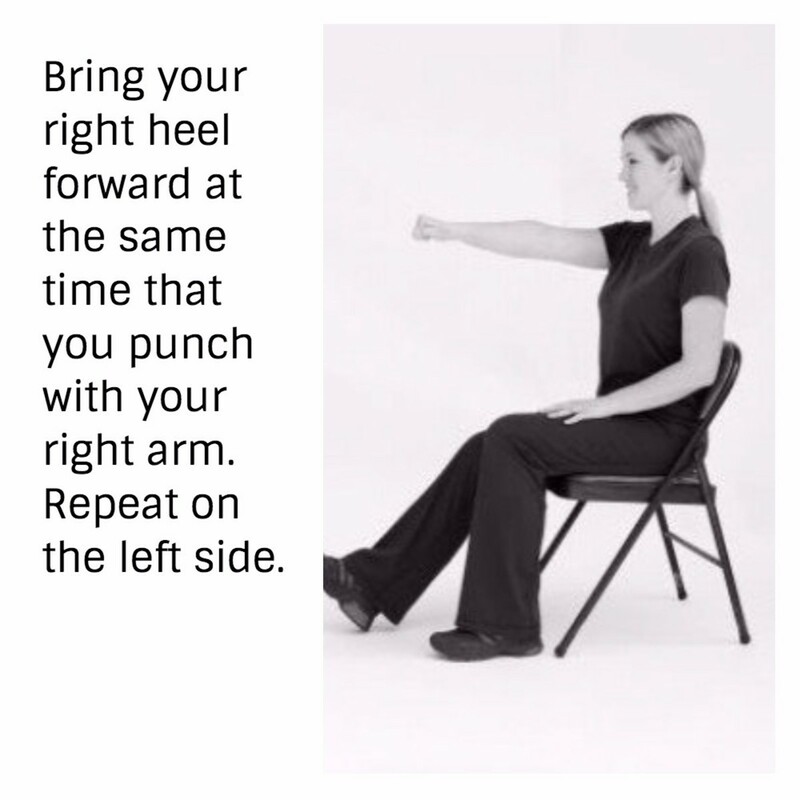 Bring your right heel forward at the same time that you punch with your right arm. Repeat on the left side. Continue alternating between left and right for 1-2 minutes, or longer if you would like! Bring your right heel forward at the same time that you bring your right arm forward and up. Repeat on the left side. Continue alternating between left and right for 1-2 minutes. If bringing your arm up high hurts your shoulder, bring your arm straight ahead instead. Stretch your ankles and feet. 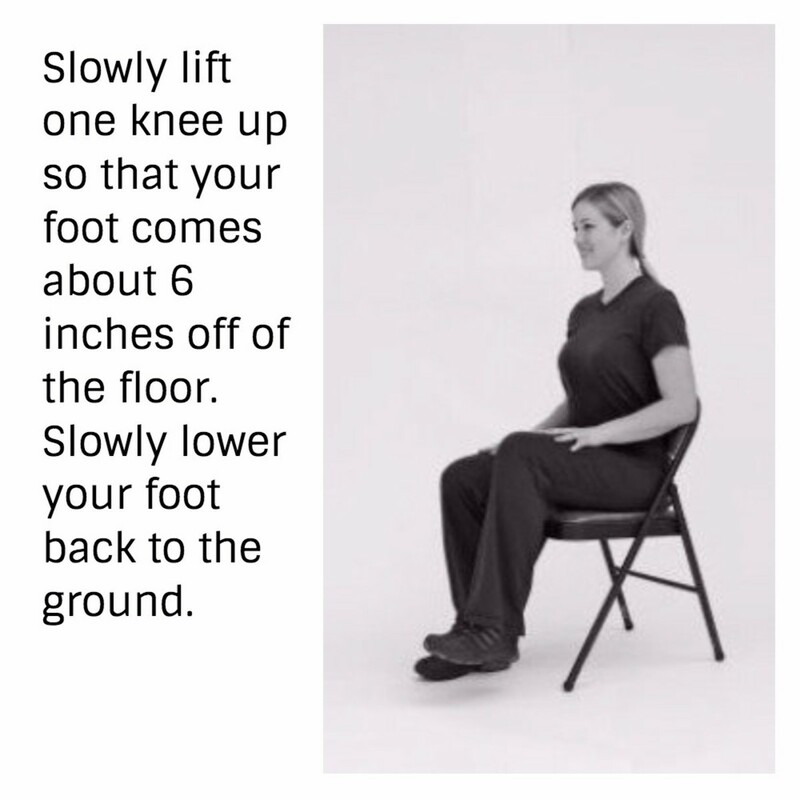 Lift one foot up and rotate your ankle clockwise 5 times. Switch directions for 5 more ankle circles. This stretches the ankles and calf muscles. Point your toes down and then flex them back up 5 times on your right foot. Repeat on your left foot. Slowly lift your toes up while keeping your heels on the floor. Lower your toes back down and repeat 10 times. Start with both feet flat on the floor and about hip distance apart. Slowly raise your heels up and then lower them back to the floor. To increase the difficulty of this exercise, set light weights on your thighs or put on ankle weights. Also, you can pause and flex your calf muscles after raising your heels up and then lower your heels back down. Start with one leg and slowly lift your knee up so that your foot comes about 6 inches off of the floor. Slowly lower your foot back to the ground. To increase the difficulty of this exercise, add ankle weights or put a light weight on top of your thigh. Perform 10 repetitions on each leg. This exercise strengthens the hamstring muscles. 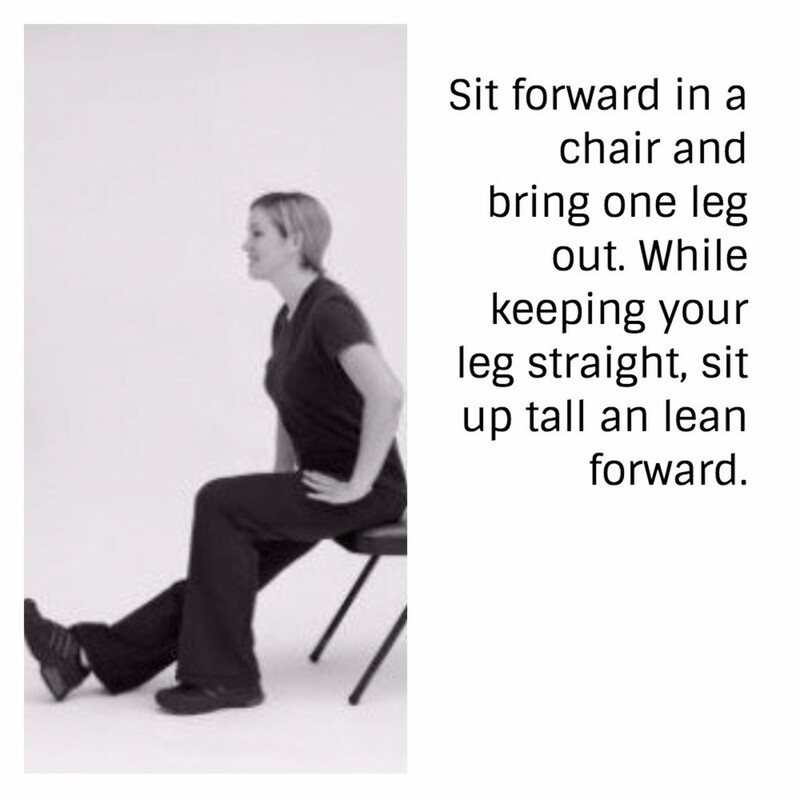 Scoot forward in your chair and sit up tall with your feet flat on the floor. Step one foot back and then slowly bring it back to where you started. Repeat 10 times on both legs. To increase the difficulty of this exercise you can add ankle weights. This exercise strengthens your hips and thighs. Start with both feet firmly planted on the ground, about shoulder width apart. Step your right foot about 12 inches to the right and then slowly bring it back in. Repeat 10 times on each leg. To increase the difficulty of this exercise, add ankle weights. Start with both feet firmly planted on the ground, about shoulder width apart. Step your right foot about 12 inches to the right and then bring it back in. To increase the difficulty of this exercise add in your arms. Bring your arm up and keep your elbow bent. As your right leg moves to the side bring your right arm to the side at the same time. Repeat on your left side. Alternate for a total of 10 repetitions per side. Weights are optional. Start off with 1 lb weights if you have never tried weightlifting before. Feel free to increase the weight as needed. Start with both arms down. 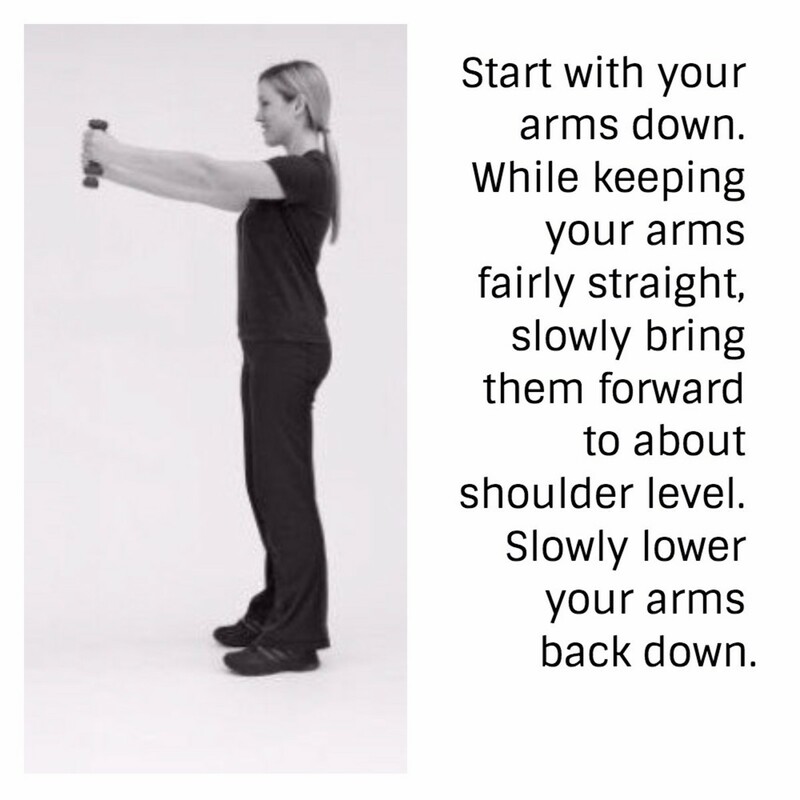 Bring your hands up towards your shoulders and then lower them back down. 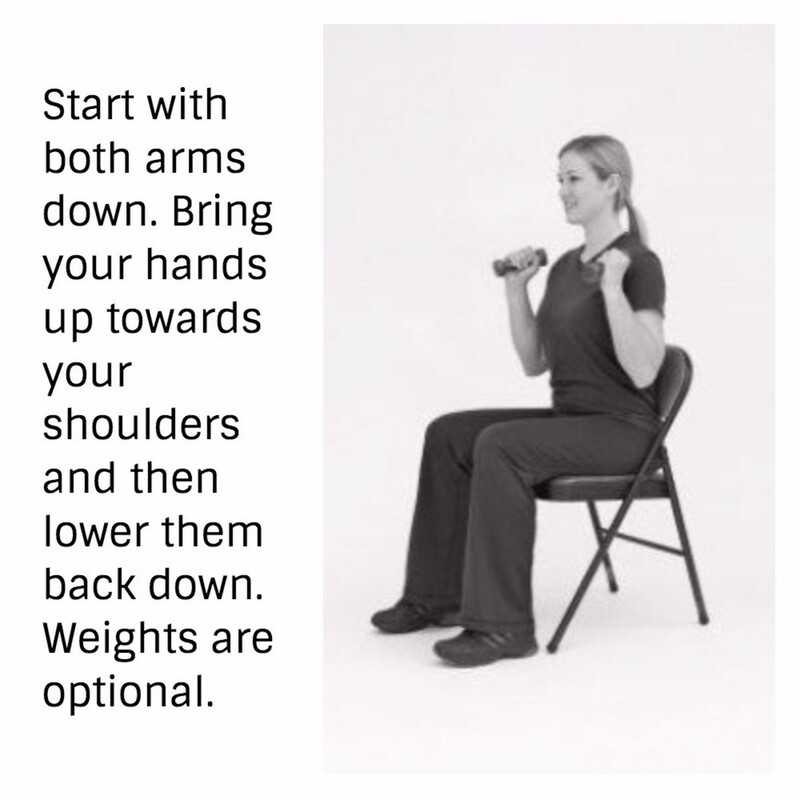 Using weights with this exercise will strengthen your shoulders. You can do one arm at a time if you would like, or you can do both arms at the same time. Start with your arm(s) down. 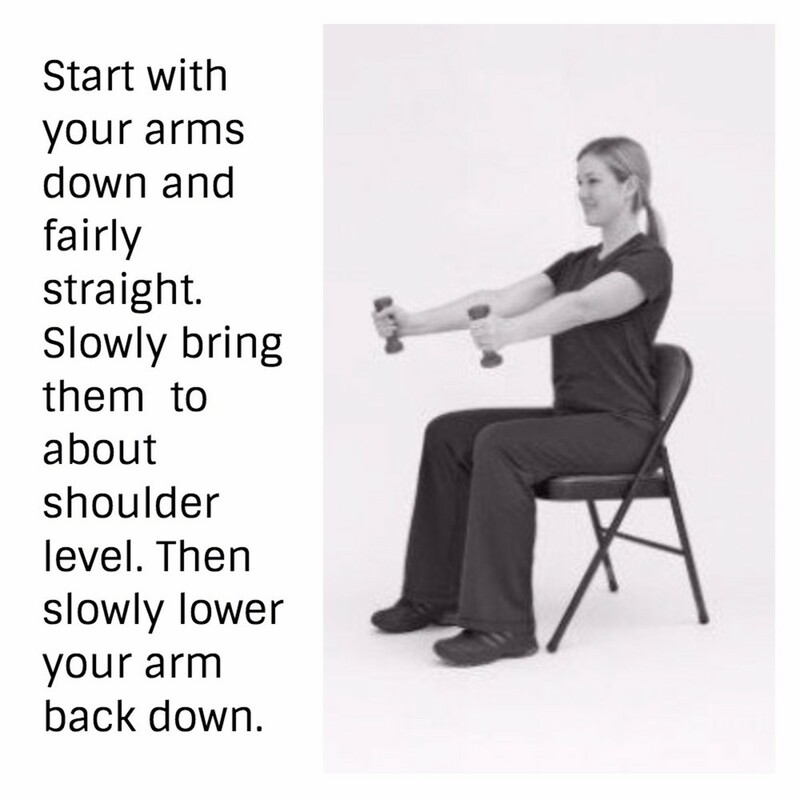 While keeping your arms fairly straight slowly bring them forward to about shoulder level. Slowly lower your arm(s) back down. 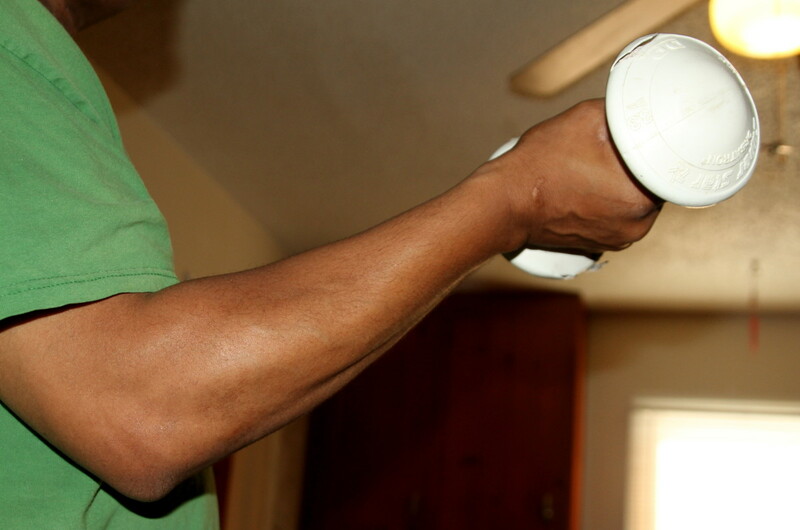 This works the front part of your shoulder (anterior deltoid). 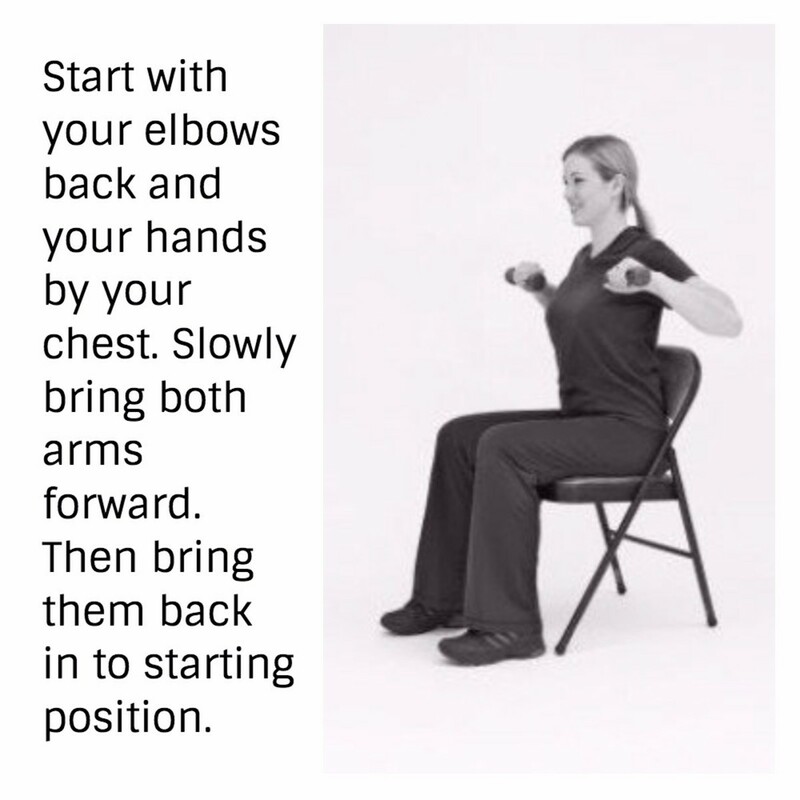 Start with your elbows back and your hands by your chest. 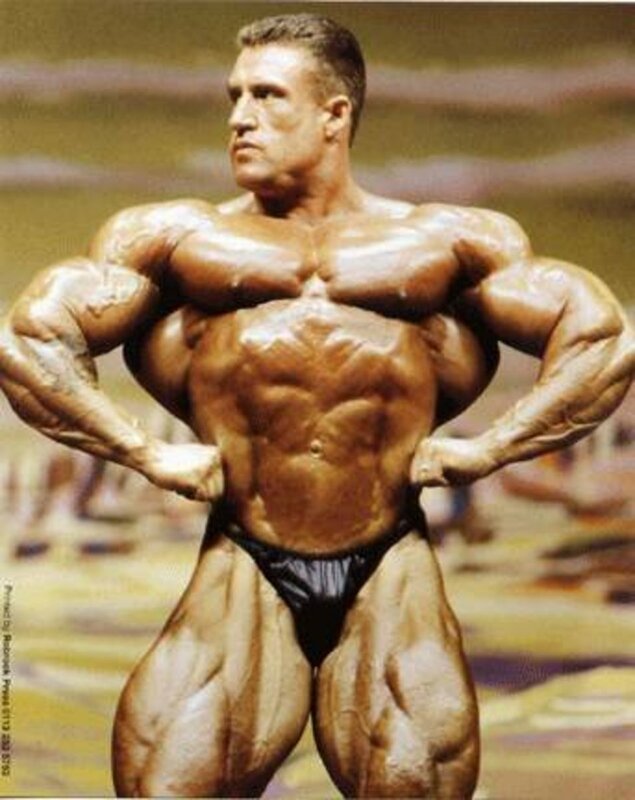 Slowly bring both arms forward and slightly upward, and then slowly bring them back in to your starting position. Repeat 10 times. This exercise strengthens the triceps (the muscles in the back of the upper arm). Lean forward slightly. Bring your left hand next to your left hip and bring your elbow behind you. Extend your arm straight back while focusing on keeping your elbow in the same position. Slowly bring your arm back down. Do 10 repetitions on each side. The following exercises are more difficult than the seated ones, but they will improve balance and strength for those able to do them. Strengthen your legs while improving balance. 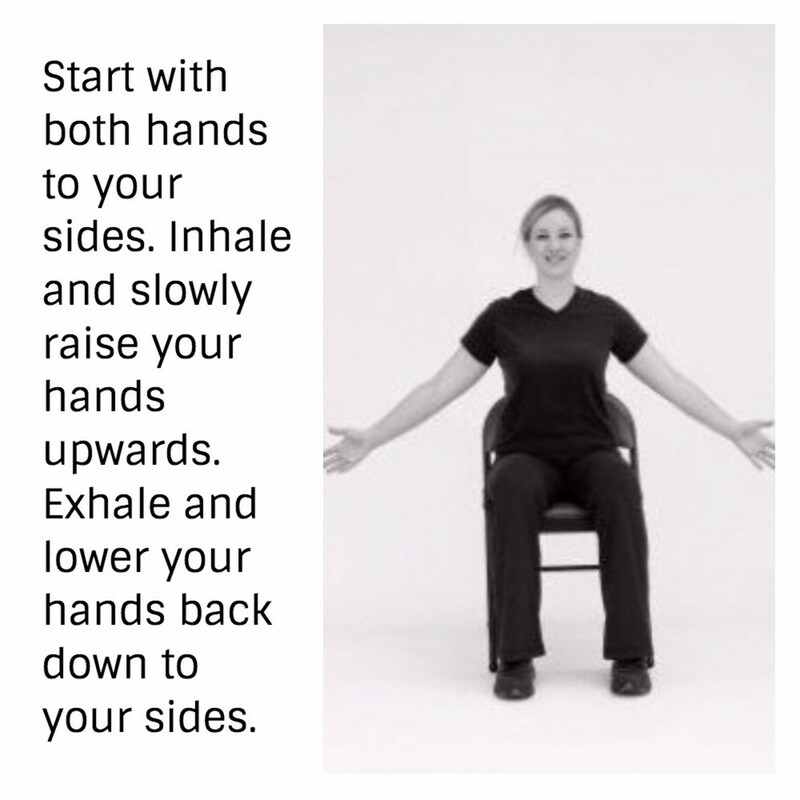 Start by sitting in a chair with your arms at your sides. Slowly stand up and then sit back down. Repeat 5-10 times. This exercise strengthens the dorsiflexors, the ankle muscles in the front of your leg. 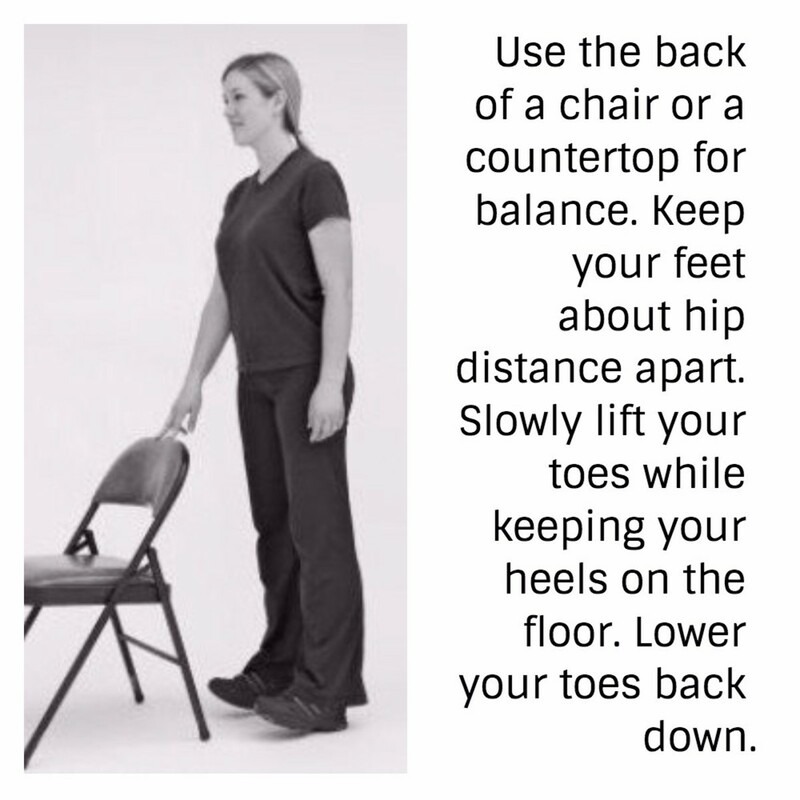 Stand up tall and use the back of a chair or a countertop for balance. Keep your feet about hip distance apart. Slowly lift your toes up while keeping your heels on the floor. Lower your toes back down and repeat 10 times. To increase the difficulty of this exercise you can use ankle weights. This exercise strengthens your quadriceps, the muscles in your thigh as well as your hips. Stand up tall and hold onto a char or counter if you need support. Slowly lift one knee up as pictured. Lower your foot back down. To increase the difficulty of this exercise add ankle weights. Repeat 10 times on each leg. This exercise works your hamstrings (the muscles in the back of your thigh). 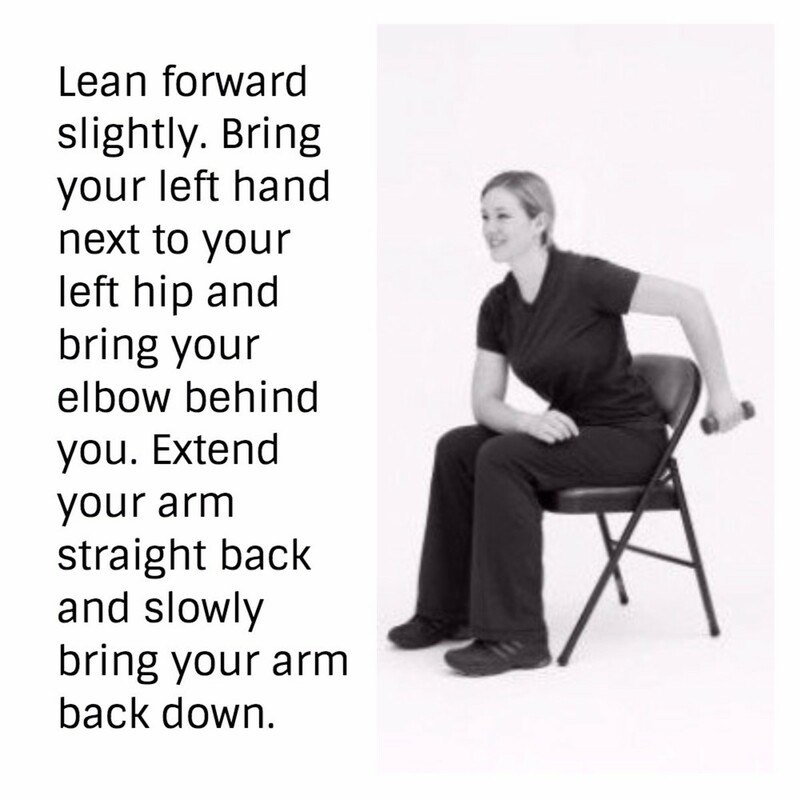 Stand up straight and hold on to a table, counter or chair for extra balance. Bring one foot back as pictured. Bend one knee and raise your foot behind you. Lower your foot back to your starting position. Try 5-10 repetitions on each leg. To increase the difficulty of this exercise you can add ankle weights. This exercise strengthens the muscles in the buttocks and also the lower back. Stand up tall and hold onto the back of a chair. Step back from the chair and lean forward a little. 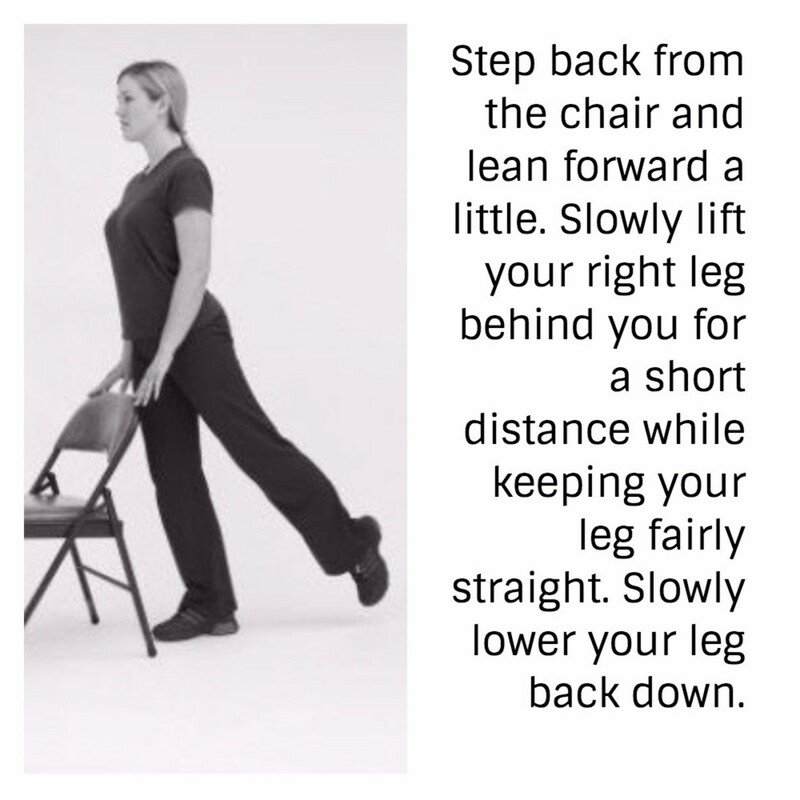 Slowly lift your right leg behind you for a short distance while keeping your leg fairly straight. Slowly lower your leg back down. Repeat 10 times followed by 10 repetitions on your left leg. This exercise strengthens your hips. Stand up tall and use a chair or counter for balance. Start with your left leg. Turn your left foot inward slightly and slowly bring your left leg to the side. Slowly bring your leg back in. Repeat 5-10 times on each leg. Note: Turning your foot inward protects your hip. If you have hip surgery take caution doing this exercise. Only bring your foot as far to the side as you feel comfortable. I usually bring it 6-12 inches to the side. Start off with 1 lb weights if you have never tried weightlifting before. Feel free to increase the weight as needed. Start with both arms down. 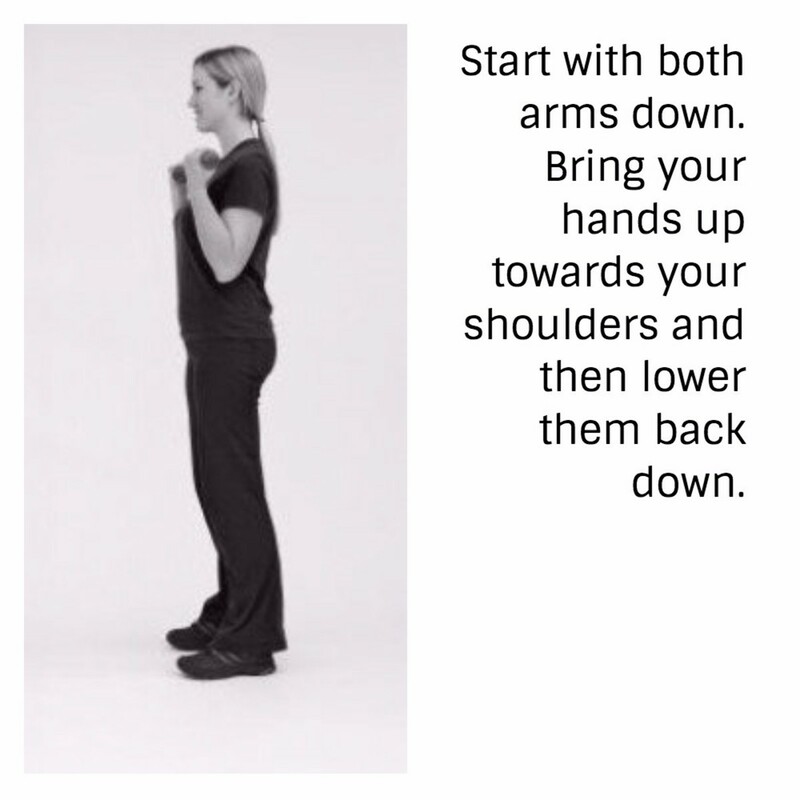 Bring your hands up towards your shoulders and then lower them back down. Try to do 10 repetitions. This exercise strengthens the triceps (the muscles in the back of the upper arm). Lean forward slightly and feel free to use a chair for extra support. 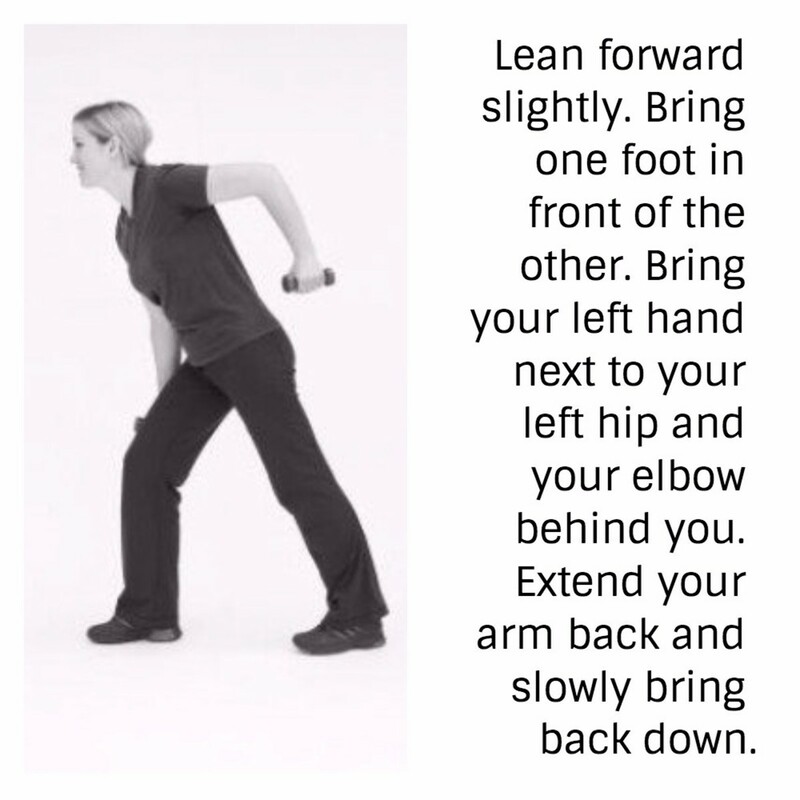 Bring one foot in front of the other and add a little bend to your knees Bring your left hand next to your left hip and bring your elbow behind you. Extend your arm straight back while focusing on keeping your elbow in the same position. Slowly bring your arm back down. Do 10 repetitions on each side. This exercise strengthens the muscles in the back of your shoulder. Step one foot back and lean forward slightly. Bring your one hand by your side and bend your elbow. Slowly bring your arm forward and then slowly bring it back in. Try 10 repetitions on each side. Sit at the front edge of your chair. 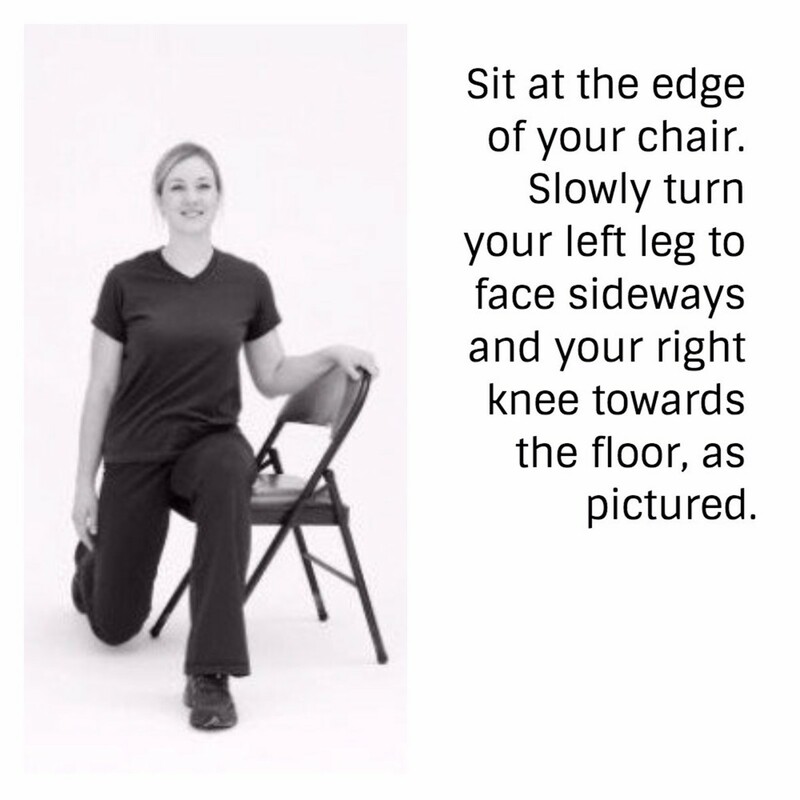 Slowly bring your left leg to face sideways and lower your right knee to the floor, as pictured. Hold this stretch for 30 seconds on each side. Sit forward in a chair and bring one leg out. While keeping your leg fairly straight sit up tall an lean forward. You should feel a stretch in the back of your leg. Hold the stretch for 30 seconds on each leg. Is there a video/dvd that has all of the above chair/stretching exercises on it? one to purchase and watch on big screen tv? Wow...great lens &amp; beautifully presented! Another great lens, beautifully illustrated! I will also link to this one when I publish my lens on movement. I am so glad i found your lens,I can't use my legs at the moment and I miss exercising this is a great lens for anyone who is off there feet at the moment. You have shared what I really need to do. SquidAngel Blessed for helping others, great photos, and being awesome! Just what I need! Great and informative lens! Thanks for sharing! God bless you! Fantastic lens! I've been needing to exercise a lot more while at the office and some of these exercises will be great to do it on my pauses! I am slowly becoming a senior myself and these exercises are just perfect for me. Thanks! I assume that anyone who is mobile enough to do these exercises without a chair would be encouraged to do so. My mother, I know, appreciates having the chair as an option in her class.